Digital metronomes help you to control your musical performance's time element. Without a metronome it can be difficult to know if your playing is even (Source). As well, when tempos become more elastic, it can become guessowrk to figure out ritards and accelerandos unless your playing is configured evenly (Source). Metronomes help you establish musical control (Source). If you're a performer, you'll find that a quality metronome can remedy poor timing issues. This prevents you from rushed and stilted performances. The goal is hone your timing and rhythm, appreciating that each musical note occurs at a precise moment in relation to its underlying pulse (Source). 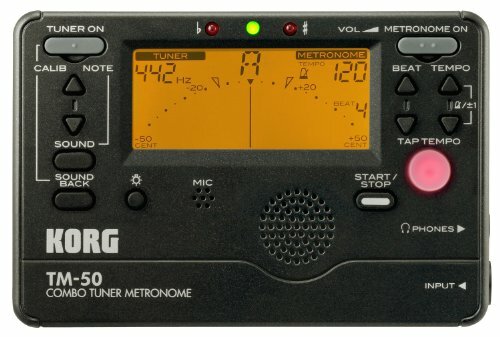 Some of these metronome practice tools include tuners (the Korg TM50, the Korg MA and the Mugig). The Neewer and Seiko are clip-on options that are especially lightweight. In fact, if you are an aerobic exerciser (runner, walker, biker), clip on metronomes are the best option to assess the cadence of your cardio routines. The Mugig has the largest LCD display- which is great for the elderly, for use in low-visibility stage areas, or if you just want clearer access to information. The Korg TM-50 has a metronome & tuner that can be simultaneously deployed. It features a robust detection range of C1 to C8A with a solid tempo range of 30-252 BPM. Utilizing 15 rhythm variations, it enables musicians to practice a diverse range of musical styles. Buyers tell us that it precisely tunes, lets you tune by ear, has a lighted screen for enhanced visibility, is relatively low-priced, and is small enuogh to comfortably fit inside music satchels or violin cases. Some buyers don't like the 'beep' sounds and prefer a traditional 'tock' sound- but, overall, this is a solid buy for professional and amateur musicians alike. This combo device offered by Korg is a good option if you are looking for a digital instrument tuner and metronome.Users love the functionality of this item, but some do complain about it not being loud enough. This product uses a newly designed needle-style LCD for excellent response and even greater tuning accuracy. The Korg TM50BK model has a wide detection range from C1 to C8, a wide tempo range of 30-252 BPM and 15 rhythm variations that let you practice with a broad range of musical styles. It is available in three colors: black, silver and white. This item seems like a solid choice if you’re looking for a unit that allows for both pitch and rhythm training. 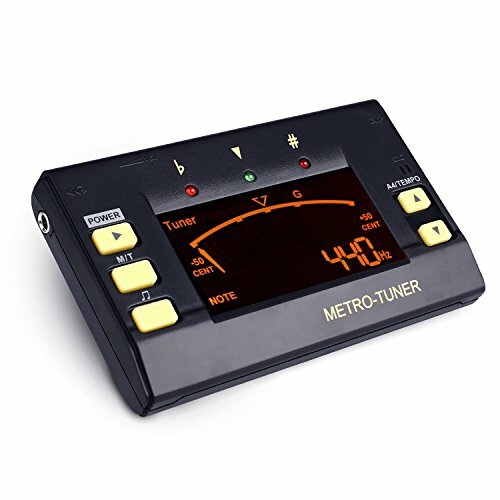 The general user consensus concerning the Korg digital metronome and tuner is that it is a wonderful tuner at a great price. Many users state that this product is versatile, easy to use and has good sensitivity. However, some buyers complain about several things: not loud enough volume, poor battery life and hard-to-read back lit display. As one dissatisfied user shares, the sound at maximum volume is medium loud and sometimes hard to hear when playing woodwind instruments. Another one says that the volume is not loud enough when two people are playing. This 3-in-1 instrument device offered by Mugig is a good option if you are looking for a metronome, digital tuner and tone generator combo. Users love the performances of this product, but some do complain about its responsiveness. This product supports various tuning modes and pitch calibration from 430hz to 450hz. It features a super large LCD display (38% greater view) and a very bright screen.This portable multi-instrument device might be a good choice for those who want a metronome with 8 different rhythms and with a wide tempo range of 30-250 BPM. In general, users have a favorable opinion of the Mugig metronome and tuner.What they praise is that it is very easy to use, precise and user-friendly.They conclude that it is a nice little inexpensive tuner. However, some buyers express complaints saying they wish it was more responsive. 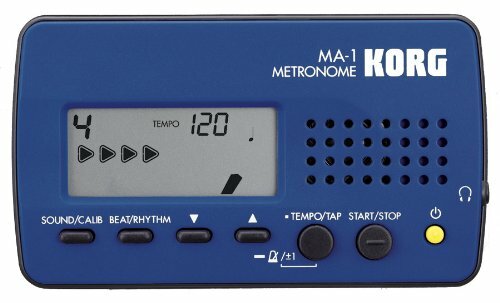 If you are looking for a top-rated digital metronome, you might want to consider this visual beat counting metronome offered by Korg.Users love the effectiveness of this device, but some do complain about its quietness and the “beeping” sound. This product’s”beat counting” display clearly shows: number of beats / current beat / beats remaining. The wide tempo range (30 to 252 BPM) can be set in three ways: full steps, pendulum steps or tap tempo button. It comes in two colors: blue and red. If you want a metronome that offers great rhythmic diversity (9 beats and 8 patterns) and full octave of reference tuning pitches (C4-B4), this might be a good option. In general, users have a positive opinion of the Korg visual beat counting metronome and they agree that it is a good metronome to fit a tight budget. As they say, it is very lightweight, small, easy to use and its timing is accurate. However, many purchasers complain about it being a little too quiet, as well as about the modern “beeping” sound it makes (instead of the traditional “click”), which some find to be bothersome. 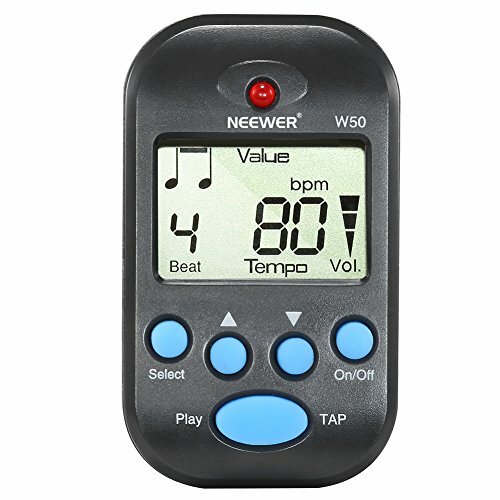 This mini digital metronome offered by Neewer is a solid option for those who want a lightweight and portable instrument device. Users love the small size of this metronome, but do complain about difficulties when using it due to its size. This product has a clip and lanyard hole design, which makes it easy to carry and fix. It is multi-functional, lightweight and portable, as well as easy to use. 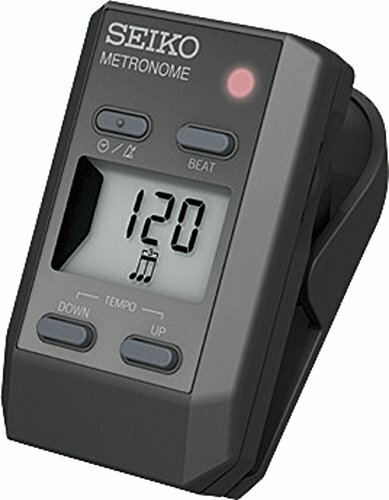 This digital beat tempo metronome could be a solid choice if you’re looking for a metronome with a tap function which enables you to test your ideal tempo or tempo of a track. In general, buyers have a positive opinion of the Neewer digital metronome and would recommend it to those who look for an extremely tiny and portable metronome. They state that it is a l so loud enough. However,buyers also agree that if you need a solid metronome for daily practicing this wouldn’t be the best choice due to tiny buttons and too much trouble it is to change the settings. As one user explains, because it can do so much, but is so small, getting it to do what you want can be a lot like setting up a digital watch. If you are looking for a clip-on metronome, you might want to consider this one offered by Seiko. Users love its functionality, but have complaints about its quality and durability. This product features a clock function, easy volume control and a high-contrast LCD. It comes in two colors: black and silver. If you are looking for a digital metronome for running cadence, then the Seiko clip-on metronome might be a solid option. In general, users are happy with the Seiko digital metronome. What they like in particular is that it is very easy to use and adjust, loud, small, light and compact. All in all, they agree that it is a great product for running cadence training. However, some purchasers complain about its quality and durability, stating that their item stopped working within several weeks of use. The first digital metronome on our list is provided by Korg. It comes in black, silver, and white colors, marketed as a metronome and tuner with a needle-type meter. A relatively advanced electronic music device, it's able to employ the metronome and tuner at the same time. Specifically, it's engineered for both rhythm and pitch training- often employed by brass bands to hone their orchestral skills. It has a relatively robust range of tempo- 30 to 252 bpm. It utilizes sound back. What this means is that it's able to determine your audio input's pitch, and the meter displays the difference in pitch between the reference tone and your input. As well, its meter scale will display minor thirds and pure majors relative to a particular pitch. This feature is a handy option for solo vocalists, acapella practice, and ensembles. Its tempo settings have pendulum step or four step options that can be delineated in one step increments. One musician tells us he's used it on his guitar, bass, and viola with professional music instructors praising its quality. As a pocket-sized metronome and electronic tuner, buyers say this Korg unit is an affordable and high-quality option. One reviewer says that because it's best used to tune instruments with sustained sounds it's essentially best employed for wind instruments where there is not any sound decay. Another reviewer provided a handy overall summation, praising its backlit screen, the quality of the metronome, the ability it provides to tune by ear, its tuning precision, its low price and small size. The second digital metronome and tuner we examined is the Mugig. It is a multi-instrument solution- and marketed towards ukulele, guitar, violin and bass players. One of the defining features is its extra large LCD display which enables you to easily view screen information which is helpful for the elderly or in dark environments on stage. Reviewers were pleased to discover that besides just purchasing a quality metronome, the tuning capability was an added benefit that enabled them to tune their pianos and stringed instruments. Another buyer who frequently used iPhone and Android digital metronomes and tuners said that this physical version was higher quality and more accurate than using an app. The third option we examined was the Korg visual beat metronome- this one does not have tuning capacity. It's marketed as rhythmically diverse- providing eight patterns and nine beats with full octave tuning pitches. Examining their marketing materials, it's promoted as a small option that provides essential rhythm training for amateur and professional musicians. One feature buyers like is its tempo tap ability- what this means is if you tap the tempo button the metronome will detect the beat and determine the beats per minute. 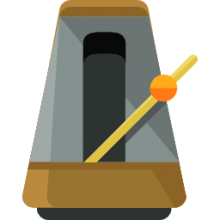 One classical pianist tells us that while an app can provide adequate functionality, a physical metronome helps you remain on the beat more consistently. The fourth option we examined is provided by Neewer. This is a lanyard styled option- meaning it clips on, which makes it especially portable. A Chinese made option, it does beep instead of click and includes a headphone jack on its right side. Reviewers were surprised at how incredibly small it is- indeed, the consensus is that it is especially tiny. While lightweight and small, it does have a robust feature set- capable of a variety of patterns, 2 16ths against an eighth note, and 8th note against a 16th, quarter notes- it's essentially pretty dynamic. On the downside, because it's so small, the user experience does suffer somewhat because of its cramped interface and diminutive display screen. One exerciser finds that for his aerobic workouts this is the best way to measure his stride and keep him at the desired pace. Other Rock 'n' Roll musicians find that it easily clips to guitar microphone cables, which is handy when they are on stage or just jamming in their home music studios. One reviewer said that on the positive side it can dynamically change time signature, rhythmic beat, volume, and tempo. On the downside, though, he complained about the quality of the buttons and the functionality of the clip. The last option we examined was the Seiko Clip-On Metronome. Like the last option we examined, many runners purchase this to clip on to their tops as they exercise to ensure a steady cadence. Another reviewer intent on perfecting cardiovascular exercise says that as a walker he employed it to train himself with auditory feedback to maintain the best pace in an efficient manner. A professional classical piano teacher tells us that it is a loud metronome to help create beat subdivisions and accents on different beats. You can also click it on to your belt- making it particularly easy to adjust and set whether you are exercising or just strumming your acoustic guitar.